Andy Bernard, Pam Beesly and Erin Hannon joined in on the fun. Is Michael Scott staging an “Office” comeback? Well, not exactly. 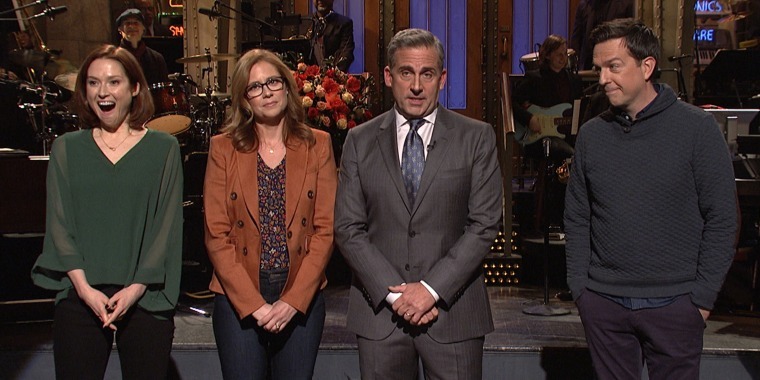 But Steve Carell did host an "Office" reunion of sorts on "Saturday Night Live," and fans were elated. The funnyman hosted "SNL" for the third time last night and in his opening monologue was met with a surprise of former cast members pressuring everyone’s favorite boss for a reboot of the comedic series. “It was a great experience, and I love all those people, but I just don’t think it’s the best idea,” Carell said in response to an actress pretending to be an audience member curious about a reboot. But then, not one, but three former cast members (you might know them as Andy, Pam and Erin) appeared in the audience to lay on the pressure. Ellie Kemper, who played Erin Hannon, was the first to second the move. Ed Helms, aka Andy Bernard, follows. “You wouldn’t have to do all those sad movies anymore,” said Helms. “Don’t you want to see what Pam and Jeff are up to?” added Jenna Fischer, jokingly bungling the name of her former love interest. So, what will it be? Will we ever get to see the Dunder-Mifflin crew’s hilarious antics again? John Krasinski, who played Jim Halpert, said back in March that he’d love for the show to come back as a Christmas special, and last fall, NBC execs said they’d definitely consider bringing back some of the network’s most popular shows (think “30 Rock,” “ER” and “The West Wing”) for an encore. Until then, we’ll just have to reminisce over all the great memories — like this adorable throwback shot of Jim, Pam, Dwight and more, on the show’s first day.